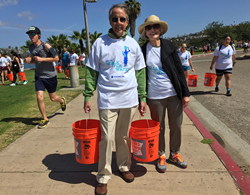 PCI President and CEO, George Guimaraes and wife Mary Beth, carry buckets of water to symbolize the more than one billion people who spend hours a day searching for clean water. “Millions face the problem of finding potable water on a daily basis, and we, as a community, can gain tips and ideas on how to conserve water locally and help ease the burden of this global issue,” said George Guimaraes, President and CEO of PCI. 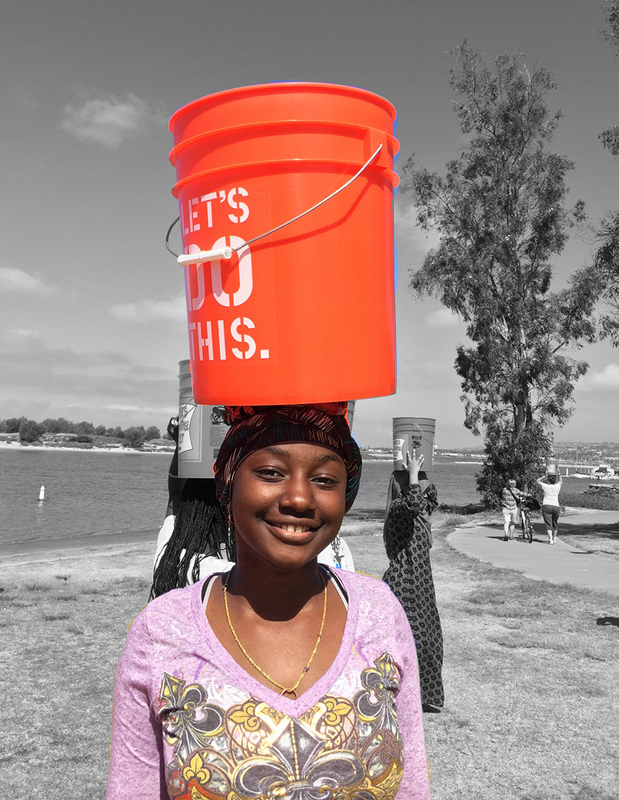 PCI (Project Concern International) brought the global water crisis home to San Diego by hosting its annual Walk for Water 5K at Tecolote Shores on April 24. Participants experienced the journey millions of women and children around the world make every day to provide clean water for their families by walking 5 kilometers carrying buckets of water. 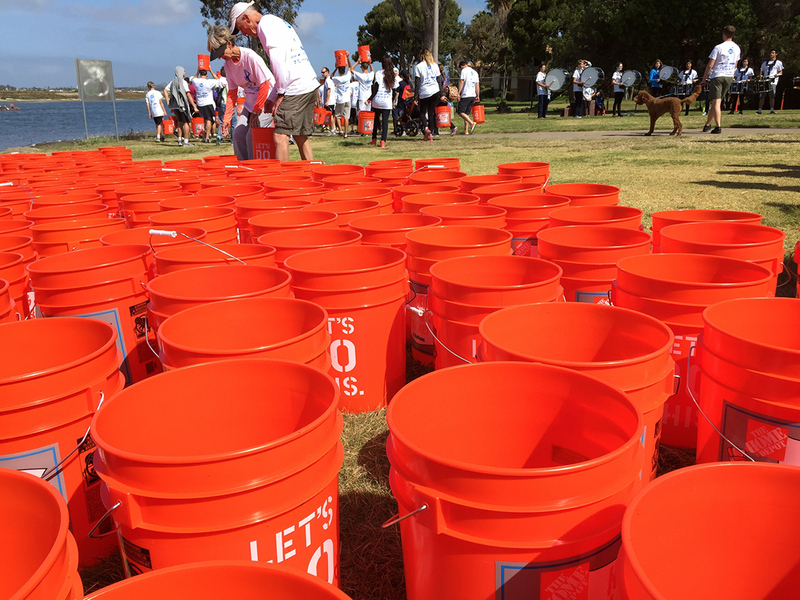 As San Diego struggles with its own water crisis, the event highlighted awareness of the global clean water crisis, and water used in the Walk was taken from and returned to the Bay. Over $70,000 was raised through the event. Walkers were welcomed to the starting line by a local high school drumline, where they collected their buckets of water. A group of refugee women who came to demonstrate how they would carry heavy buckets of water on their heads for long distances were a highlight of the event. Rachel Church, a senior at La Jolla Country Day School, and Arya Tayebi, a senior at The Bishop’s School, served as the chair of this year’s San Diego Walk for Water, and Mark Mullen from NBC 7 San Diego served as the Master of Ceremonies. “The time spent collecting water keeps children out of school,” said Rachel Church, Walk for Water chair. “Every person should have access to safe drinking water, and I’m thankful for PCI’s programs and all who supported the event in raising awareness about bringing clean water to vulnerable communities." Funds raised will support PCI’s water and sanitation programs and efforts to end poverty worldwide. About PCI: PCI’s mission is to empower people to enhance health, end hunger and overcome hardship. The most vulnerable people in the world will have the power to lift themselves out of poverty and to create vital, healthy lives for their families and communities now and for the future. For more information, visit http://www.pciglobal.org. A refugee woman demonstrates how she would carry a heavy bucket of water on her head for long distances. Event participants experienced the journey millions of women and children around the world make every day to provide clean water for their families by walking 5 kilometers carrying buckets of water.